When Paula asked us “What can I do to help?” we responded with “What’s your fantasy?” From that sprung the Breakfast Club. We weren’t sure where it was going, all we could think of was what we had read of the Paris Salons, those we had dreamed about but never experienced. We knew that we wanted to be among other artists, to share our stories, to talk about our challenges, to share our inspirations, to be inspired by each other’s work. That’s why we originally founded the Mt. 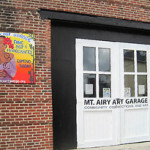 Airy Art Garage…so we could come out of isolation and find other artists. Thursday was a phenomenal start. 15 artists, count them 15. Self-taught, PAFA grads, Tyler grads, experienced art educators, social workers and art therapists, painters, sculptors, glass artists, digital artists, handcrafters, older, younger, as diverse as our membership. 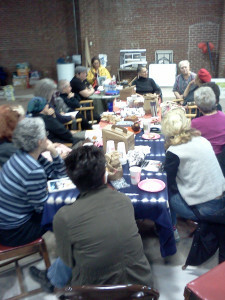 Our group included founders of the Stained Glass Project “Windows that open doors!” and founders of the Art Forms Gallery. Some are having exhibitions coming up at Drexel. Some are working with the Picasso Project. Some are part of the Knesset Israel Artists Collective. One artist lived in Alaska and traveled into native villages teaching pottery and clay. One went to Japan on a scholarship. So, the group was wonderful and diverse…and growing. So, we welcome you to join us, on the third Thursday of each month at 9 am at 11 West Mt. Airy Ave. Bring a sample of your artwork. Next meeting will be on Nov. 17 (bring your own breakfast). Even better, bring your story, bring your heart, bring your imaginations. Open to all artists.